Aaron Hernandez - Bio, Daughter, Net Worth, Wife, Dead or Alive, Is He Gay? The National Football League (NFL) will continue to feel the vacuum created by the sad exit of tight end Aaron Hernandez who met his demise on April 19, 2017. He was notable for his impeccable prowess on the pitch. Sad news of the demise of the American footballer broke that year after he committed suicide in his jail cell where he was sentenced for the murder of his friend, Odin Lloyd. Hernandez who was drafted in 2010 by the New England Patriots transformed the team alongside his fellow tight end teammate, Rob Gronkowski. Before his incarceration, Hernandez also made an appearance at Super Bowl in XLVI. Here are lesser known facts about the player. He was born Aaron Josef Hernandez in Bristol, Connecticut in 1989 to his father, Dennis Hernandez, and his mother, Terri Valentine Hernandez. Aaron who also had a brother, lost his father in 2006 when he was 16 and had to grow up with his mother. He was a student at Bristol Central High School where his football skills started to manifest. He was a wide receiver at his school’s football team – Bristol Rams. By the time he became a senior, he was made Gatorade Football Player of the Year. Aaron also led the team to the Central Connecticut Conference Southern Division Championship in the year 2006, the same year he lost his father. Moving on to the University of Florida, he became a tight end and won the National Championship in 2008. However, making it to the NFL was a hard hustle for Aaron Hernandez who was constantly rejected by NFL teams due to his failing of a drug test. It wasn’t just about the drugs, the player was inflicted with several negative records including bad peers, and other demeaning acts of youthful exuberance. But fortunately for him, he was finally drafted by New England Patriots at the fourth round in the 2010 NFL draft with the 113th overall pick. He was young; in fact, the youngest at the time, but Aaron took NFL by storm in the 2010 season with his skillful tactics, setting a rookie standard for tight ends at the team. After leading the Patriots to a 14-2 record at the AFC championship, he combined forces with Rob Gronkowski, his fellow tight end to notch 24 touchdowns and 2,237 receiving yards in Super Bowl XLVI. They, however, lost to the New York Giants afterward. His remarkable performance at the teamed earned him a five-year extension of his contract in 2012. Hernandez kept on soaring until 2013 when he was found guilty of the murder of his friend and semi-pro football player, Odin Lloyd. It all started on June 17 that year when the body of the player was found in a location nearby Aaron’s residence in North Attleborough in Massachusetts. After intense investigations by the police, traces led back to Aaron Hernandez and he was arrested on June 26. After glaring pieces of evidence were reviewed, it was proved beyond a reasonable doubt that Aaron was the murderer. He was also facing murder charges for Daniel Abreu and Safiro Furtado who were both shot and killed in a drive-by shooting in 2012 in Boston. At that time, Hernandez’s contract with the England Patriots was already terminated and he had already lost sponsorship by his team and other corporate sponsors. Hernandez was found guilty of first-degree murder and five firearm charges which meant that he was immediately sentenced to life imprisonment. Aaron Hernandez who was serving his life sentence was found dead and hanging by his bedsheets at the Souza-Baranowski Correctional Center in Massachusetts on April 19, 2017, five days after he was acquitted of the Boston murders. His death was ruled a suicide after an autopsy was conducted. At the peak of his career, Hernandez’s net worth was estimated at $8 million. However, when the player’s life was plagued with diverse controversies, his fortunes gradually dwindled, crumbling down to just $50,000 at the time of his death. The late NFL player who was basking in his million dollar contract with the New England Patriots started to experience financial meltdown following his arrest earlier in 2013. Having lost his 7-year deal worth $39,582,000 in 2012, as well as sponsorships, he stopped receiving his salaries which amounted to huge sums of money. He was paid as his base salary, $540,000 among other benefits that summed up to $11 million in his first year. Hernandez ran out of money as he spent large sums to pay legal bills as well as his lawyers. Aaron Hernandez had a family of his own before his death. Though he was not married, he was in a relationship with Shayanna Jenkins, with whom he had a daughter, Avielle Janelle Jenkins-Hernandez. The couple who began their relationship in 2007 grew from lovers to fiancés in 2012, following their engagement. Shayanna Jenkins is a sister to late Odin Lloyd’s fiancée, Shaneah Jenkins. Talks about Hernandez’s sexuality made the news after the death of the NFL player. Months after his death, reports from some sources said that Aaron struggled with his sexual orientation which could have been part of the cause of his suicidal end. 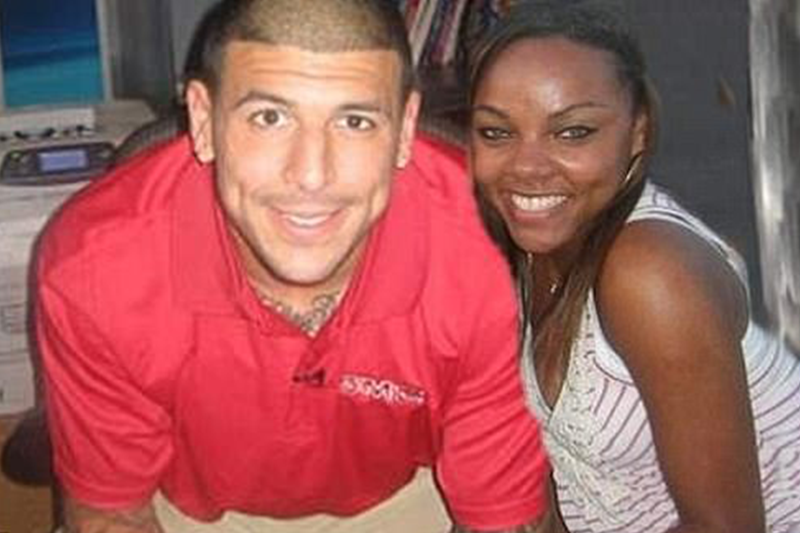 Reports emerged that an ex-girlfriend of the former NFL player, Alyssa Anderson, as well as an attorney revealed that Aaron Hernandez had gay relations when he was alive although he always denied it.